It has been a few months since I last checked on my honeybees. It was a quiet evening and finally not hot. I put on my bee suit and went back to open up the hive to see how the girls were doing. I've see them flying around often, so I wasn't very worried. The bees seemed pretty calm, so I didn't bother to fire up the smoker. I don't like using it. I concentrated on staying calm while moving slowly and mindfully. I didn't want to squish any of the bees while I checked things out. The only tool I used was a bread knife to cut the bridge comb and loosen the bars. Bridge comb is when the bees attach the honeycomb on the bars to the inside of the hive. The bees did a great job making the hive airtight with propolis. The bars were all sealed together and to the hive body. My first view inside the hive. 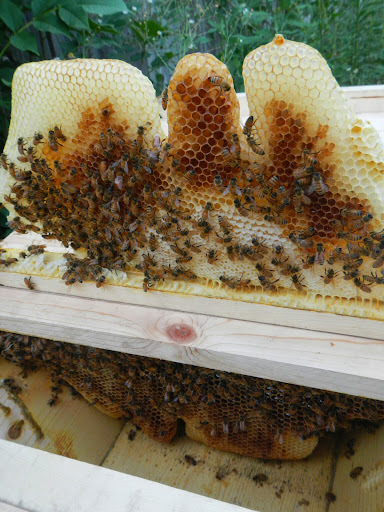 This comb is almost finished and full of honey. Further into the hive and lots of capped honey. I hope they are able to make enough to feed themselves through the winter. I don't plan on taking any of their food (honey). 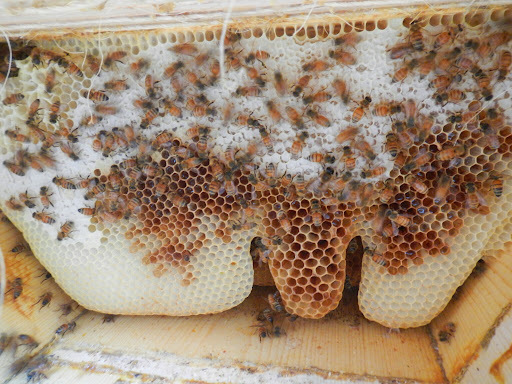 A view of the comb inside the hive. This is the comb on the end and isn't quite finished. The comb on the end taken out, so you can see it better. It was only partially attached, and much heavier than it looked. The weight is due to all the honey. I was very careful to turn it along the vertical axis to avoid breaking it. I had a fun time looking at the hive. I added a few bars to give them more space since they had used up everything so far. I am far from an expert, but they seem to be healthy. I didn't see any obvious signs of disease or pests. I'm very happy the bees seem calm. I might check on them one more time before winter if time allows.